Soffi. The purity of light and glass blown by Venice's master craftsmen. The minimalistic design of GamFratesi captures the exact moment when the blowing technique gives the glass its shape. Delicate and irregular globes seem to float out of a slender leather arm suspended in the air by the force of gravity. The project is inspired by an ancient art translated into a simple yet contemporary language. The outer globe, ephemeral and almost weightless, is in faded tones of milk-white or smoky grey. 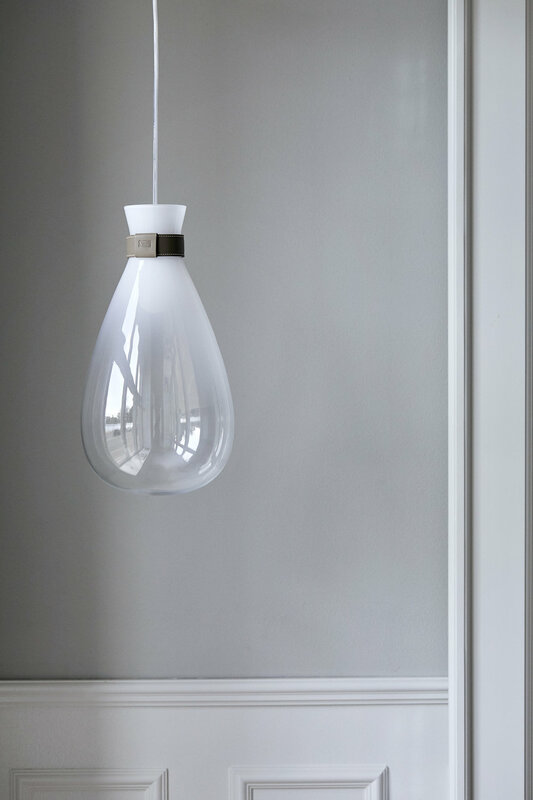 The globe holding the light, in blown glass in an opaque white etched finish, is solider visually. When lit, the lamp blossoms with an even and diffused light, which enhances the faded tones of the outer glass and its gradual transparency. The magical and harmonious effect can be used to light various different settings, made even more evocative by the unique nature of each Soffi lamp, with subtle differences in tone and irregular shapes created by blowing different colours of glass. The lamps are available in three sizes, small, medium and large, which can be arranged in a range of configurations. As well as an individual lamp, the design can also be arranged in linear compositions of three globes or hanging arrangements with three or five globes.